Iranian President Hassan Rouhani said Tuesday that Iran can cope with the economic turmoil of falling oil prices, adding that Saudi Arabia and Kuwait will be harder hit. Rouhani said that while oil now only accounts for one-third of Tehran’s budget, some of the Gulf states are up to 95 percent reliant on it. “If Iran suffers from the drop in oil prices, know that other oil-producing countries such as Saudi Arabia and Kuwait will suffer more than Iran,” he said. Rouhani was addressing a crowd in the southern city of Bushehr – home to a nuclear power plant built with the help of the Russians, which became operational in 2011. “Those [countries] who have planned the oil price reduction against some countries should know that they will regret it,” he said, without elaborating on what countries he meant. 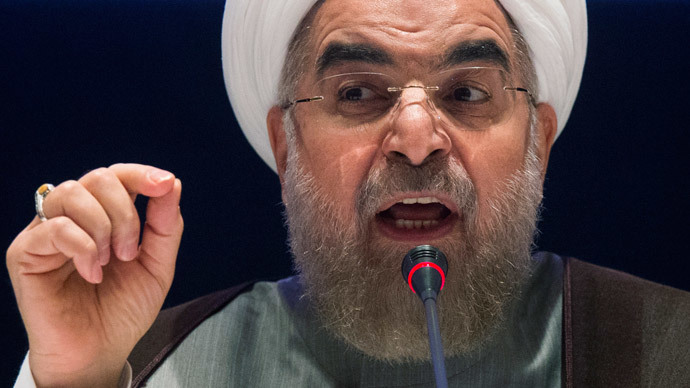 Rouhani was elected in 2013 on promises to turn around Iran’s sanctions-hit economy. He has successfully lifted the country out of recession and recently began to stress the importance of non-oil exports. Iran was somewhat caught off guard by the slide in oil prices, as its current budget was based on sales at US$100 a barrel. Tehran cut that estimate to $72 in March but oil has now hit a six-year low, with Brent crude trading at just $46. With Rouhani at the helm, inflation rates have halved to less than 20 percent. With progress in talks regarding Iran’s controversial nuclear program, some sanctions by the West have been lifted. But as oil prices continue to tumble, there is now the prospect of a deficit in Tehran, particularly as businesses are cut off from loans in the international banking system, as most of the sanctions still remain in place. By seeking to hammer out a deal with the six world powers, Rouhani had hoped to breathe life into the Iranian economy by opening Iran up to foreign companies and partnership deals. Due to Western sanctions, Iran’s oil exports have dropped from 2.5 million barrels a day in 2011 to about one million barrels today, according to the US Energy Information Administration (EIA).